Each Chartered FB Advisor and Expert Sourcing Firm takes a forward motion perspective in providing a robust array of services and product solutions. • They maintain an array of professional designations. • They have years of dynamic business engineering experience. • They adhere to the FB code of ethics. 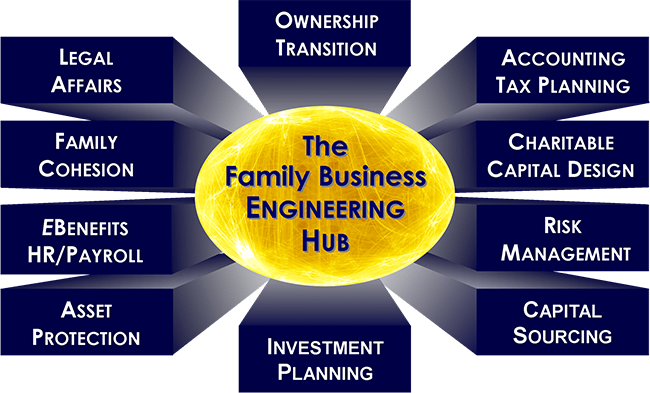 The content on this site, including opinions, data and other information, is provided by Family Wealth Hub, LLC (FWH) and its division, Family Business Hub, for your personal information only. FWH is not an investment advisor or broker-dealer and does not provide investment advice or recommendations to buy or sell securities, to hire any investment advisor or to pursue any investment or trading strategy. The information contained in the Expert Sourcing and FBH Advisors profiles and other information on this site has been provided to FWH by third parties. FWH does not guarantee the accuracy of or endorse the views or opinions given by any third party content provider to this site. FWH does not assume any responsibility or liability for information accessed via hyperlinks ("links") to or from third party sites. The existence of such links should not be construed as an endorsement, approval or verification by FWH of any content available on linked sites.